During her childhood – much of which she spent in her native Bad Bayersoien – Isolde Holderied was somewhat different. Other than her friends, she wasn’t interested in dolls but preferred to play football or ice hockey with the boys. At the age of 15, she enjoyed her first motoring experience – on a small moped. Once again, she competed with her male class mates and was keen on being the fastest. “No matter what kind of sport I was pursuing, I always wanted to win,” reveals Isolde. “And I retained this absolute will to win until today.” A kind of willpower she also displayed when arduously saving the money for her driving license and her first car. Henceforth, the days when Isolde didn’t drive her car were extremely rare. At that time, she trained as a solicitor’s clerk and covered some 100 kilometres a day on her way to the office in Garmisch-Partenkirchen and back home again. 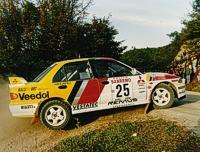 The ‘Spitzbub-Rallye’, in November 1986, represented the start of her own rallying career. In Bußjäger’s car – lent to her for the event – she made her first effort as rally driver and set competitive times right from the start. Her taskmaster was convinced of the Bavarian’s skills and advised her to contest a driver search course organised by the motor racing magazine ‘Rallye Racing’ and the Sunday tabloid ‘Bild am Sonntag’. A course that would turn out to be the start of an impressive career. Following the advice of Karl Bußjäger – who believed in the skills of his young co-driver – Isolde contested a driver search course organised by the motor racing magazine ‘rallye racing’ and the Sunday tabloid ‘Bild am Sonntag’ back in 1987. Günther Frauenkorn, the organiser of the nationwide competition, was determined to find the most promising candidate among the bunch of skilled young female rally drivers. From the second stage, Isolde was driving an Opel Kadett GSI. And in the qualifying contest, she once again proved her driving skills. Furthermore, she convinced the members of the jury with her knowledge of the theoretical and her unlimited commitment. At the end of the course, Isolde had defeated some 1,000 female drivers. By winning the driver search course, she had secured a seat in the ‘Rallye-Club Deutschland’s’ (RCvD) ‘Ladies-Junior-Team’ and an entry in the 1988 ‘Deutsche Rallye-Trophäe’. “I had hoped to have the necessary talent”, says Isolde. “And when I was selected, it was a dream come true. But the events of the years that followed were even more exciting.” Now, the young Bavarian began a three-year motor racing apprenticeship and gained not only a lot of experience alone but also clinched her first successes. Following some appearances in regional rallies, after having won the 1987 driver search course, Isolde contested the 1988 ‘Deutsche Rallye-Trophäe’ with an Irmscher Opel Kadett GSi and finished fifth in the production car class G. Furthermore, she scored points in events held in her native Bavaria, and at the end of the year she was runner-up in the Bavarian Rally Championship. The following year, Isolde finished sixth in the ‘Rallye-Trophäe’ and fourth in the German Junior Rally Championship. “For me it was crucial to spend as much time as possible behind the wheel and to gain as much experience as possible,” says the two-time Rally World Champion. In 1990, she made the next step up the rallying ladder. 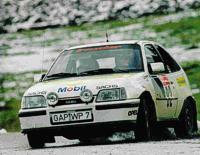 The 1990 ‘Rallye Trophäe’ represented her first start as Group A competitor, behind the wheel of a Opel Corsa GSi. By clinching four class wins, she attracted the attention of sponsors and potential new teams. 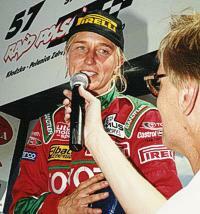 Furthermore, she contested her first events abroad, such as the Hungarian Budapest Rally. In 1991, Isolde left Opel and made her first move to a new manufacturer. From now on, she dove an AM-Holzer Motorsport entered Mitsubishi Galant Dynamic 4. She and her experienced team made a great Group N debut in the German Rally Championship by finishing fourth in the first round, the ‘Niedersachsen-Rally’. Nevertheless, Isolde’s development continued at full speed. In 1992, when contesting her first World Championship round, the Monte Carlo Rally, she was rewarded for her hard work by clinching the hard-fought Ladies’ Cup and finishing 19 th in the overall rankings. In the same year, she also contested another World Championship round – the Finnish 1000 Lakes Rally – as well as the European Championship and the German Rallye Championship and won the Ladies’ Rankings in each case, with her Group N victory in the ‘Deutschland-Rallye’ being the icing on the cake of her successful season. With her new co-pilot, Sweden’s Tina Törner, Isolde returned to Monaco for the 1993 Monte Carlo Rally. Again she won the ‘Coupe des Dames’ and this time improved to 12 th place in the overall rankings. In the Group N, she made it to the podium by finishing third. For the rest of the season, she contested the German Rally Championship with a Group A Mitsubishi and made history by becoming the first woman to win a German Rally Championship round: the ‘Niedersachsen-Rallye’. In 1994, Isolde contested her first full World Rally Championship season (Group N) and succeeded in proving her skills in this category by surprisingly winning the San Remo Rally. At the end of the season, she was first in the Ladies’ rankings, thus clinching her first World Championship title, with her runner-up position in the Group N overall rankings being just as impressive. In 1995, she finished tenth in the Monte Carlo Rally, thus clinching her first top ten result, and won the Ladies’ Cup for the fourth consecutive time. Furthermore, she successfully defended her World Championship title. Now, the name Isolde Holderied was definite household name in Germany’s motor racing world. As a tribute to her achievements, the ADAC elected the Bavarian ‘German Driver of the Year’. After her years of apprenticeship, Isolde had now celebrated the successes she always dreamt of. And her Mitsubishi years were over. For Isolde, the 1996 switch to Toyota represented a move up to Group A, the highest category in international rallying. The 30-year-old became the first female ever to have been signed as a Toyota works driver. From now on, Isolde drove an all-wheel driven 300bhp Toyota Celica GT-Four and teamed up with a new co-pilot: Catherine François from France. At the end of the season, she finished fourth in the German Rally Championship. In 1997, Isolde produced her masterpiece in Monte Carlo: finishing eighth in the historic event’s overall rankings, thus clinching her best ever Monte result. “To be able to stand up to the entire World Championship field was something truly extraordinary,” she recalls. “Furthermore, I succeeded in winning the Ladies’ Cup for the fifth time.” In addition to these international successes, Isolde finished fifth in the ‘Deutschland Rallye’ and third in the ‘Hunsrück Rallye’. Due to her regular co-pilot, Catherine François, being on parental leave, Isolde now teamed up with Anne Chantal Pauwels. However, in five events, the pairing made it to the finish line only twice, with the runner-up position in the Hunsrück Rallye being Isolde’s best season result. In 1999 – with François back in the co-pilot seat – Isolde contested the Monte Carlo Rally for the penultimate time. She clinched her sixth Ladies’ Cup win and finished 13 th in the overall rankings. Behind the wheel of a WRC car (Toyota Corolla), she also contested the Spanish, Italian and Corsican World Championship rounds and clinched another second place in the Hunsrück Rallye. 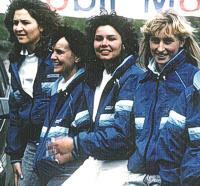 The year 2000 represented Isolde’s final full championship season – in the European Championship. In Italy, she finished third, thus clinching another rostrum result, finishing the season fourth. The 2001 Deutschland Rallye, which had now applied for the World Championship status, was the last rally Isolde was to contest, thus far. A portrait of Isolde Holderied: Here, you will find many interesting facts about the successful sportswoman.